This is 32KG Metal Gear Digital Servo, it uses high-precision potentiometer with new design, high torque enables the servo to have high quality and performance. It can be commonly used in RC Car Helicopter Boat Airplane. It is the best choice for you. High performance programmable digital standard servo. High-precision steel gears with hard anodizing. 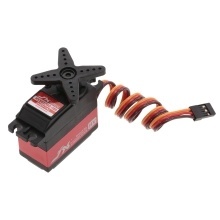 The high torque enables the servo to have high quality and performance. Pulse width: 500 – 2500μs. 180 degree rotation. Controllable angle range from 0 to 180 degrees. The middle case of the servo is made of aluminum, it can enhance the heat dissipation and ensure servo motor work well. There could be a few deviations due to manual measurement.